The Journeys Spa is located at the all-inclusive Wyndham Sugar Bay Resort in beautiful St. Thomas! Known as America’s first paradise, St. Thomas is located in one of the most picturesque geographical areas in the world - the US Virgin Islands. The spa features six treatment rooms, a private couple’s massage suite, hydrotherapy rooms, and an outdoor massage cabana. The awesome views and breezes from the Caribbean Sea and lush tropical landscape adds to this exquisite experience. Journeys Spa services are intended to be restorative to encourage the body’s natural healing capabilities. The professionals at Journeys Spa will customize each treatment to address your specific and changing needs. Choose from treatments such as the Hot Stone Massage, Sugar Glow or the Fijian Scalp Massage. For best results, steam, sauna and relax! 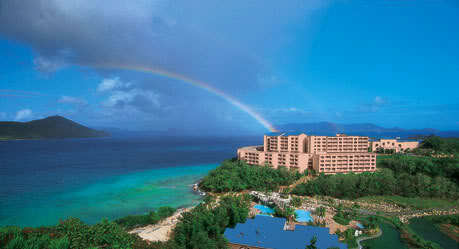 The Wyndham Sugar Bay Resort & Spa is situated hillside at the northeastern end of St. Thomas. Set amidst 31 lush tropical acres, the resort overlooks the blue waters of Water Bay to the north and St. John and the British Virgin Islands to the east where the Atlantic Ocean and Caribbean Sea meet to create Pillsbury Sound.